Ronald McDonald House Charities of Alabama is excited to partner with Shipt in a new way that has really helped the families we serve. Shipt is an on-demand grocery delivery service based here in Birmingham that is winning fans all over the U.S.! Locally, the company is committed to making Birmingham a better place and has previously worked with RMHCA. “Shipt is thrilled to have the opportunity to donate goods to RMHCA bi-weekly during new employee training! It’s the perfect way for new hires to experience Shipt’s service and its commitment to the community first hand,” said Shipt Community Outreach Specialist Liz Cook. 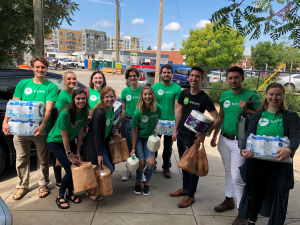 Shipt has been involved with RMHCA previously by donating to community and special events, but this new, bi-weekly delivery is a natural fit for Shipt’s values of volunteerism and customer service. And the team members say the experience has been invaluable. “Delivering to RMHCA was a humbling experience. It helped open my eyes to how much care and time Shipt puts into the community that we serve. What better way to start my new career than by giving back to an organization such as RMH whose sole purpose is giving!” one of Shipt’s new hires said. “Our goal is to always be of service to others and the RMHCA sets a great example of putting people first. 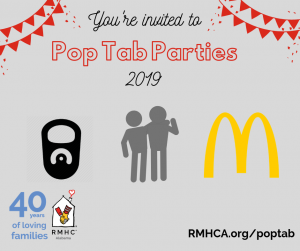 We will always do our part to help them fulfill their mission,” said Shipt Experience Team Trainer Ian F.
Shipt coordinates with RMHCA on what items are most needed and has been able to supply items ranging from milk and eggs to cleaning supplies. Currently, a different group of new hires will be able to experience delivering to the House but Cook says the company hopes to grow the program. “Hopefully, we can expand our deliveries to RMHCA so familiar faces will return to the House,” she said. RMHCA is grateful to Shipt for their generosity and looks forward to welcoming many new Shipt employees to the Ronald McDonald House and our mission!